Don’t want to roast a whole turkey this year for Thanksgiving? Keep it small by roasting a Cornish Hen with Homemade Classic Stuffing plus other menu ideas for hosting Thanksgiving For Two. How many people are you hosting for Thanksgiving? One feedback I hear often is how you appreciate my scaled-down recipes since you often only need 2-4 servings. That got me thinking about you for Thanksgiving. Do you host a giant Thanksgiving? Or are you like me where you still only need 2-4 servings? A few years ago, Food Network hosted their Thanksgiving Live. As it was playing in the background, I heard one couple ask how they could make a Thanksgiving meal since it’d only be the two of them. Even though it’s common to host large families, sometimes you simply don’t have a large family. Or everyone’s schedules make it difficult to get together on one day. Or it’s not even November yet you’re craving Thanksgiving in June. With my family, there’s only four of us – me, my parents, and my brother. I don’t host at my apartment, so I do most of the cooking at my parent’s house. We never do a whole roasted turkey as we’d have leftover for literally months; not only is it too much food for 4 people, my mom and brother don’t eat a lot of turkey to begin with. Sometimes we may make stuffed turkey breasts or turkey legs, but 90 percent of the time, we make Cornish Hen with Homemade Classic Stuffing. We make two hens to serve four people then use any leftovers for chicken salad. Today I’m sharing my traditional recipe with you because I know I’m not the only one who doesn’t need to cook a 20 pound turkey for the biggest food holiday of the year. What is the difference between a chicken and a Cornish hen? A Cornish game hen is a type of chicken breed and may be referred to as a broiler chicken. It’s smaller than a regular chicken and ideal for small family meals. Cornish game hens can be purchased all year round, usually in the frozen chicken section. That means you can still enjoy a small Thanksgiving dinner any day you want, not just in November. What’s the best way to cook Cornish hen? I love to go simple when cooking my Cornish hen because they really are delicious with the proper amount of seasoning. I brush the outside with olive oil then rub it with salt, black pepper, and thyme. You can use your favorite herb on hand or substitute your favorite seasonings, such as garlic powder. Whatever you do, don’t cover the pan with foil or you’ll lose the crispiness of the skin. The foil traps in the heat, steaming the chicken including the skin. How many people does one Cornish hen serve? It depends on what you’re serving with your Cornish hen. If you’re serving it with a small side dish such as Green Beans with Almonds and Olives, then it’s best to make one hen per person. However, with a large feast like Thanksgiving where you’ll be serving a lot of food, one hen will easily feed two people. Maybe even three people if you’re feeding someone with a small appetite such as a child. My recipe only makes one hen for a true Thanksgiving For Two recipe. However when I cook for my family, I make two hens because there are four of us. If you’re like me who makes two hens, simply double the recipe and use a 13×9 pan to bake both hens at once. How do you make homemade Thanksgiving stuffing? 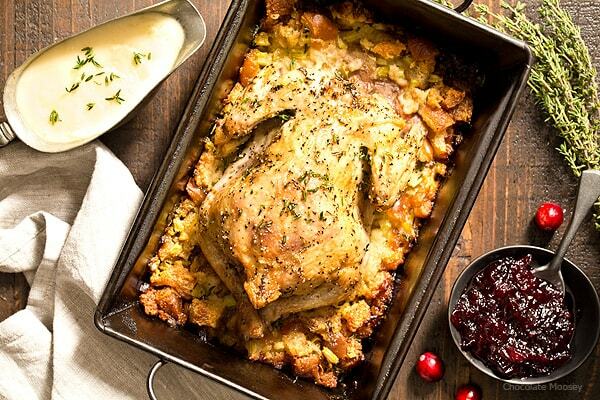 Instead of using boxed stuffing this year, opt for making homemade classic stuffing! All you need to do is cut up bread, onion, and celery then toss with melted butter. Seriously it’s that easy. This classic stuffing recipe is actually my mom’s recipe, including the celery. I’m not a fan of celery, but this is the one time I make an exception. After stuffing the bird, you can lay the extra in the bottom of the roasting pan. It’ll soak up the juices from the meat plus get crispy on the edges from the oven. Personally I love the crispy edges better than what’s inside the bird. Since the likelihood of you reading this while planning your Thanksgiving menu is very high, here are links to my favorite accompanying dishes. For a full list, check out my Thanksgiving For Two Dinner Menu. Homemade Gravy Without Meat Drippings – This recipe makes 1 cup, so it’s your call whether you should cut it in half. If you’re using it for both mashed potatoes and Cornish hen, you may want to make the whole recipe. Easy Cheesy Scalloped Potatoes – This recipe frees up oven space, so you can cook it while you wait for the Cornish hen to finish. Garlic Parmesan Au Gratin Potatoes – These au gratin potatoes do require oven space, but you can cook them at the same time as the hen. Since the hen cooks at a slightly higher temperature, the potatoes will be done a little faster than the recipe says. Green Bean Casserole Without Canned Soup – Using a small casserole dish will still allow you to eat your favorite Thanksgiving casserole with minimal leftovers. Small Batch Cranberry Sauce – Makes one small jar, which is about 2-4 servings. Serve any leftovers on some baked Brie! Don’t want to roast a whole turkey this year for Thanksgiving? 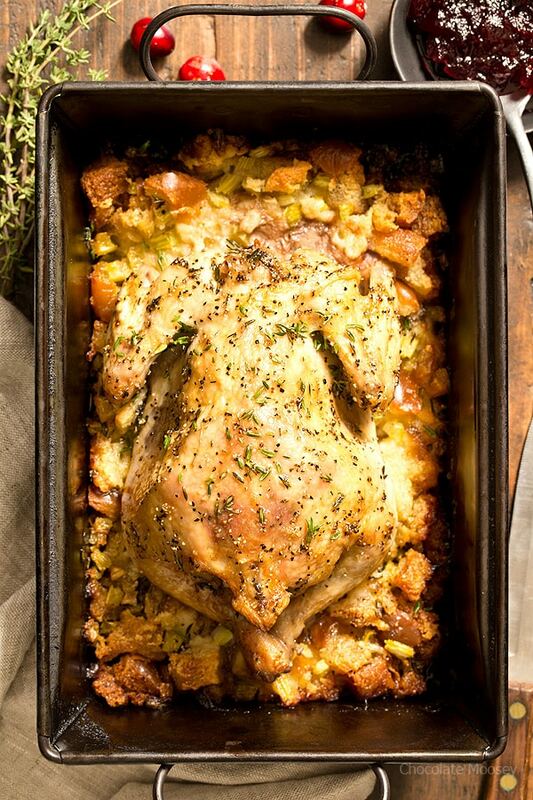 Keep it small by roasting a Cornish Hen with Homemade Classic Stuffing. In a large skillet, melt the butter. Once hot, add the onion, celery, and a big pinch of salt. Cook until softened, about 5 minutes. In a large bowl, add the bread, onion mixture, and salt. Mix together until the bread is moistened. Preheat oven to 400F. Have a small roasting pan or 8x8 pan ready. In a small bowl, mix together thyme, salt, and pepper. Fill the hen with stuffing. If there is stuffing leftover, add it to the bottom of the pan. If there is no stuffing leftover, add a roasting rack to the pan. Tie the hen's legs together with oven-safe twine (optional but keeps the legs in place) then place on top of the stuffing or roasting rack. Brush the hen with olive oil then rub the thyme mixture all over, getting underneath the wings, legs, and skin whenever possible. Bake for 50-60 minutes or until juices run clear when thickest part of chicken is pierced and internal temperature reaches 180°F. I totally could’ve used this the past 10 years or so! There’s just 3 of us, and I’m the weirdo who doesn’t like turkey (I do like playing around with the leftovers more than the actual Thanksgiving meal). I’ve just been buying split turkey breasts & roasting one of those. It’s MORE than plenty for 2 adults & 1 child. My mom and brother aren’t huge turkey fans either, so it would basically be me and my dad eating a whole turkey. Just no LOL If everyone loves chicken, you should give Cornish hen a try this year! How long to cook 2 hens? It’s still going to be roughly the same time. However, depending on the hot spots in your oven you may need to rotate positions halfway through to ensure even cooking. 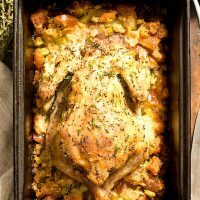 This looks wonderful I love cornish hen and the stuffing is a real treat along with them. Always a classic pairing for the holidays! I like the idea of adding the extra stuffing to the bottom of the pan. It looks so festive and must be delicious. Is there a reason you put the hen breast-side-down? I’ve seen it done both ways and was wondering if there’s a benefit that i’m not aware of. This sounds like a great Thanksgiving-y meal for a smaller crowd! It helps the skin crisp up plus keeps the breasts nice and moist. Love this! I went to Thanksgiving once where we were served cornish game hens instead of turkey and I thought that was brilliant! Great recipe! I personally like hens better than turkey. Hope you give this a try! What good time to post this recipe. I am only cooking for three of us this Thanksgiving so you have inspired me with the game hens. Love this idea. Oh yes this recipe would be perfect for you! If you decide to make 2 hens for 3 people, this recipe can easily be doubled. This is such a great idea for a small group! I’d even love this for a fun, leisurely Sunday meal. Thanks for sharing! Oh yes this recipe is wonderful any time of the year! There’s something special about serving a whole bird (even if it’s a small bird like a hen). You’d be surprised at how delicious simple seasoning can be! Just make sure you don’t skimp on the rub. There is no marinading in the recipe. However, you can brush and rub the chicken up to a few hours beforehand. How long to cook 4 small (24 oz) Cornish hens? I haven’t had to cook 4 hens at once, but here’s what I would do: I would plan on cooking the full 60 minutes. Check each bird’s temperature. If it’s not at least 180F, put it back in for probably another 10-15 minutes or so (depends on how far off you are in temperature). If the skin is burning, you can tent the pans with some aluminum foil. Make sure you don’t overcrowd the oven because you want the heat to circulate evenly. Also if your oven has hot spots (aka some of your birds are browning more than the others), you may need to rotate your pans around. Does this have the same safety concerns as stuffing a turkey? I’ve always heard that you should cook the stuffing separately. But this sounds so good! I haven’t had an issue, but there can be concern. 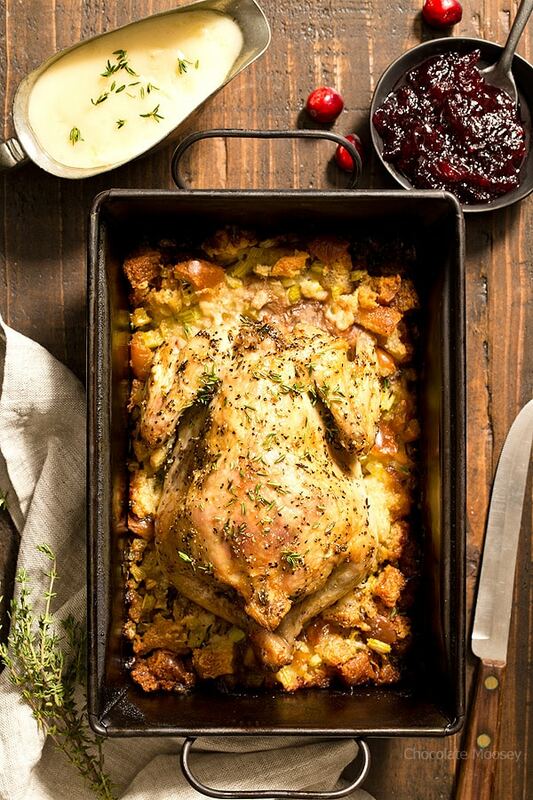 The main reason is the hen juices seep into the stuffing, so it needs to reach 165F to kill any harmful bacteria. However, a hen is much smaller than a turkey, so it should be less of an issue. If you still have concern (esp if you are serving anyone with a weak immune system), check the stuffing with a digital thermometer. Cooking instructions for stuffing say to “stir until moistened” but ingredients doesn’t list any moistening agent. It’s the melted butter from the step before it. Great recipe but not good for a ciliac. Neither of us are crazy about rhyme but basil works good to. Use gluten free bread for the stuffing mix and butter instead of olive oil for coating the bird. If you want a crusty coating for the hen, grind up some pork rinds and shake it over the bird. Best coating there is and it’s gluten free. and doesn’t soak up as much liquid. Thank you for your tips on how to make the recipe gluten free! As for the pork rind coating, the Cornish hen doesn’t need it because the skin will crisp up after baking. However, I love the idea for skinless chicken breast and thighs.